I fear, based on my blogging habits, that you think I only eat cookies and ice cream, and thus I must be made of sugar and butter and cream cheese and chocolate. But fear not, gentle reader. I do like fruits and veggies! I am a woman of substance, fiber and protein. Unfortunately, those sorts of things are not very fun for me to write about. Do you really need to know that my standard dinner is salad, pasta or a hummus-pita-veggie sandwich? Who needs a recipe for that? And not that you need a recipe for a delicious/nutritious breakfast, but maybe you want one. 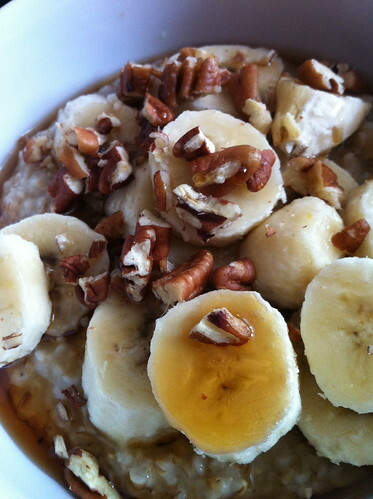 The recipe is this: steel-cut oatmeal (cooked for about 30 minutes), topped with sliced bananas, chopped pecans and maple syrup. See? Healthy and delicious! And pretty too.